Fiery, foot-stomping, braid-swinging soul singer Sharon Jones has died, at the age of 60. The dynamic force behind beloved soul revival group Sharon Jones And The Dap-Kings, Jones had spent the last several years battling against pancreatic cancer, a struggle captured in this year’s heartwarming documentary Miss Sharon Jones! Raised on gospel and baptized in funk, Jones didn’t formally break into music until she was already 40 years old. (Previous careers included working as a corrections officer and an armored car guard.) Working as a backup singer, she caught the ear of Gabriel Roth and Philip Lehman of Pure Records, who included two of her songs on an album by the Soul Providers. A few years (and defunct record companies) later, and the Providers would form the backbone of Jones’ own band at Daptone Records, along with members of the Mighty Imperials. Often described as “the female James Brown,” Jones and the Dap-Kings burst onto the soul scene in 2002, with Dap Dippin’ with Sharon Jones and the Dap-Kings. From there, the group made a rapid ascent, releasing six more albums over the next 13 years. At the same time, Jones became known for her electric talents as a performer, throwing herself around the stage with practiced skill, kicking off her shoes, and inviting the crowds to lose themselves with her in the music. In 2013, Jones announced that she had been diagnosed with pancreatic cancer. Rather than retreating, though, she continued to fight; her good humor and desire to retake the stage—eschewing wigs and performing bald after chemotherapy forced her to shave her signature braids—are chronicled in Barbara Kopple’s film, a highlight at the 2015 Toronto Film Festival. The film’s premiere had a cloudy lining, though: Jones announced at the event that her cancer had returned. 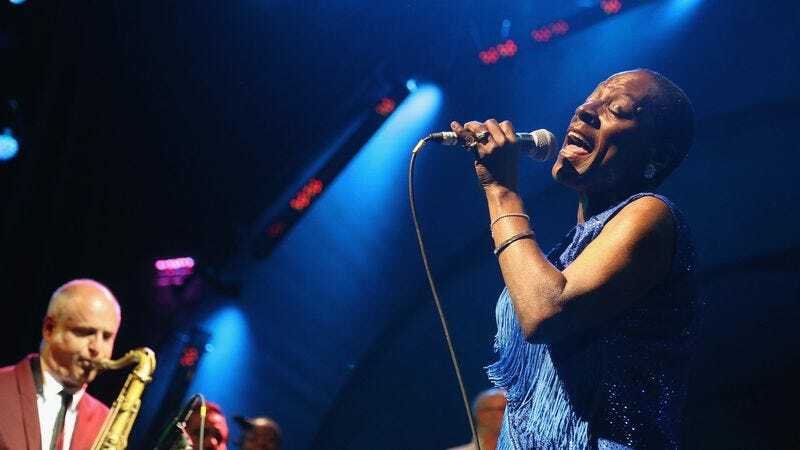 The official Sharon Jones Twitter account announced her death earlier this evening. A statement was also issued, saying, “We are deeply saddened to announce that Sharon Jones has passed away after a heroic battle against pancreatic cancer. She was surrounded by her loved ones, including the Dap-Kings.” In lieu of flowers, donations can be made to the James Brown Family Foundation, Little Kids Rock, and The Lusfgarten Foudnation, which raises funds to battle pancreatic cancer.